Bearville Insider Forum > About Buildabearville! > Looking for Special Guests! Last edited by LizzieAsparagus; 05-21-2012 at 09:34 AM..
well I've seen Green Tracks doing gymnastics, and I think he is very cute. 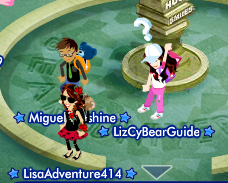 today i met chloerocks and miguelsunshine. it was so cool. i said hi and thy said hi back here are some pics. me and my friend samantha were so excited. This month, I met all 4 guests at once. They gave out cute star hats! It was awesome! I have met Green Tracks. That's it.. I met MaxineClarkCEB about a week or so ago. 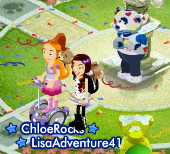 It was really cool, because we all got to have a long chat about Bearville, how nice it was, and even what we wanted for Christmas in Bearville! I have met Chloe twice, GreenTracks twice, MiguelSunshine twice, and Maxine once.